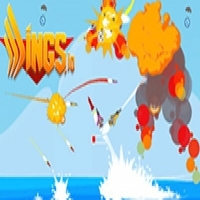 Wings is a incredibly fun and addictive 2d shooter game, you begin your journey as a fighter pilot with control over a small plane. Everyone else starts in the same position and aims for the same thing which is the top spot on the leader board. Fly around the map taking out anyone who dares venture into your iron sights using over 10 different weapons available to pick up around the map! Game directions: In Wings.io you play as a fighter pilot and your first objective is to take out everyone else, remember its a free for all so everyone will probably try killing you at some point, why not get the first shot? Around the map are both glowing orbs and weapon crates, the orbs are collected to increase score and restore your health a small amount each, the weapon crates are self explanatory in that they give you a random weapon with limited use to use against your opponents. Bare in mind that these weapons will be several times stronger than the starting Gatling gun and can range from a missile launcher to a Tesla cannon, it really is a lucky dip of ways to destroy enemy planes! Controls The controls are very simple, to move your plane simply use the mouse cursor to lead the nose, both left click and space bar can be used for shooting to suit whatevers more comfortable for you.